Myriam Dunn Cavelty, Senior Researcher and Coordinator of the Crisis and Risk Network (CRN) and Victor Mauer, Deputy Director of the Center for Security Studies (CSS) recently published the Routledge Handbook of Security Studies. The field of security studies has undergone significant change during the past 20 years, and is now one of the most dynamic sub-disciplines within international relations. It encompasses issues ranging from pandemics and environmental degradation to more traditional concerns about direct violence, such as those posed by international terrorism and inter-state armed conflict. A comprehensive volume, comprising articles by both established and up-and-coming scholars, the Handbook of Security Studies identifies the key contemporary topics of research and debate today. This work is a benchmark publication with major importance both for current research and the future of the field. It will be essential reading for all scholars and students of security studies, war and conflict studies, and international relations. The Handbook can be purchased online. For more information on international security check out the ISN website. Myriam Dunn Cavelty and Victor Mauer (eds.) 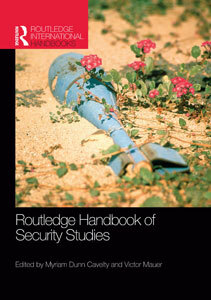 (2009), Handbook of Security Studies, London and New York: Routledge.